Another day…another beer, beer #269 that is. Today’s beer is Longshot Honey B’s Lavender Ale by Samuel Adams. Brewed in Boston, Massachusetts, this Herbed/Spice Beer has an ABV of 5.5% and it part of the Sam Adams Longshot series Sam Adams hombrew contest) created by Caitlin Declerco, a Sam Adams employee. The color of this brew was a clear gold with a white head. The nose was herby and floral with a touch of honey and a bit grassy. The aroma of lavender was unmistakable. The honey hit me first in the taste and all throughout the mouthful was the lavender…almost too much of it as it was sweet to the point of being sickening. There was a nice underbelly of malts in the flavor of toast all throughout. It had a body bordering on being heavy and syrupy with a moderate amount of carbonation. I wasn’t a fan of this, sorry Caitlin. The sweetness of the lavender wasn’t my thing but I will giver her props for trying something different. I did enjoy the honey and the stickiness of this brew though. So it wasn’t all bad. On my nightly walk around the old ‘hood I happened to noticed, according to the GPS app I have on my phone, that I had burned 190 calories. That got me thinking that over the course of the first 199 beers, with an average of possibly 250 calories a beer, I have consumed 49750 calories…give or take a few thousand. Can you say holy crap? That is like eating 166 slices of pepperoni pizza or 85 Big Macs. Just some food for thought. It gives me even more incentive to get out and ride my bike or walk more and for longer distances. Beer #199 is Good JuJu by Left Hand Brewing Company from Longmont, Colorado. Stats – Herbed/Spiced Beer with an ABV of 4%. Appearance – Clear golden yellow with a tiny white head. There were tons of carbonation bubbles rising to the top, just look at the photo, those bubbles were caught perfectly. Nose – Ginger, bready malts. Taste – Pretty much ginger throughout the whole taste profile. Mouthfeel – Light body, low carbonation, smooth. This was a unique beer (not sure I have ever had a beer brewed with ginger) that I enjoyed. I could see myself relaxing on the deck with this after a long day at work. It was really easy to drink with the low ABV and the smoothness it had. I like ginger…a lot…so I liked this. If you are looking for something light and you like ginger…give it a try. Beer #111 is Agave Wheat by Breckenridge Brewery. 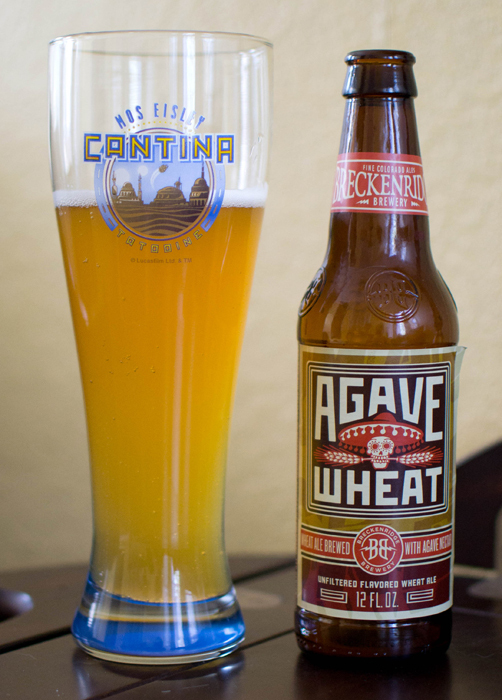 This Herbed/Spice Beer, ABV of 4.2%, is brewed with the nectar of the Great Salmiana Agave plant. When I think of Agave, I think Tequila. When I think Tequila, I think of nights spent by the porcelain god after indulging in too much of that Tequila. I broke out a Weizen glass from none other than the Mos Eisley Cantina which I picked up on a recent trip to Tatooine. There is a great house band, Figrin D’an and the Modal Nodes, that plays there nightly…check them out if you ever find yourself in the Arkanis Sector of the Outer Rim Territories. I know, I’m a Star Wars dork and a geek…so sue me. Into said glass I poured this hazy golden yellow beer. There was a tiny off-white head…nothing to write home about. The nose was very weak. It mostly consisted of a faint wheat aroma. There was a faint citrus smell, a sour aroma, and something I couldn’t identify. I can only guess it was the Agave nectar. I took a sip and got a bit of lemon and a lot of wheat. The mouthfeel was thin with very little carbonation. Super easy to drink but one was more than enough. I’m not quite sure what I was expecting when I saw this was brewed with Agave nectar. It was very forgettable and just plain blah. I would easily pass on this if I was offered it again. Beer…is it truly the worlds oldest alcoholic drink? Some say yes…some say no. But what do I know? I know what I know. And I know I like beer and could care less if it was the oldest alcoholic drink in the world. With that said, lets drink some beer! 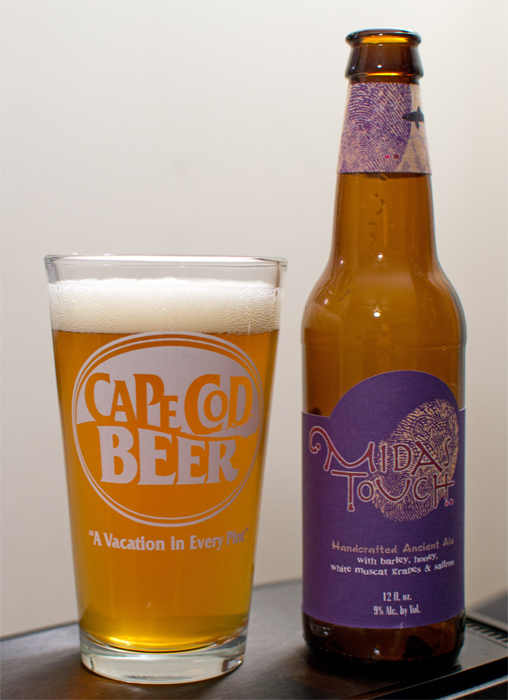 Beer #52 is Midas Touch by Dogfish Head. An Herbed/Spiced beer with an ABV of 9%. According to Dogfish, this brew is based on an ancient Turkish recipe using ingredients from 2700 year old drinking vessels found in the tomb of King Midas. Cool stuff indeed. A small white head adorned this golden yellow brew. Nose was sweet with honey, grapes (think grape juice) and grains. Taste was sweet grapes, very much like wine but with a hoppy bitterness. It finished very dry with an aftertaste that reminded me of Welch’s Grape Juice. The body was a wee bit on the heavy side, almost syrupy. This was a sipper as the higher alcohol content comes through, more so as it warms up. Overall a unique beer. I give credit to Dogfish for trying an ancient recipe such as this. On a side note, as I was finishing the drink I peered down into the glass and a face (made up from holes in the foamy head) was staring back up at me…frowning. What that has to do with anything I really don’t know. The above quote is attributed to Ben Franklin, whether he said it or not will be debated for ages. Regardless, it is a fitting quote for lovers of beer. Todays beer of choice is Poor Richard’s Tavern Spruce Ale by Yards Brewing Company. This particular brew is in the category of a herbed/spiced beer. It has an ABV of 5%. 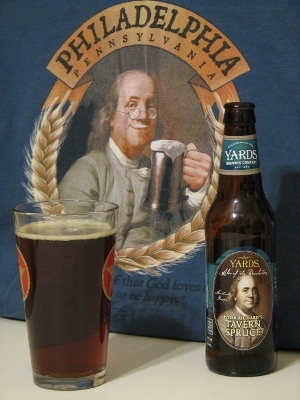 A few interesting notes from the Yards website is that this beer was brewed to celebrate Ben Franklin’s 300th birthday and was based on Mr. Franklin’s original recipe which called for spruce essence and molasses. This should prove to be an interesting drink indeed. The beer pours a nice clear brown color with a thin tan head. There is not much in the way of carbonation going on…almost looks flat. Smell was molasses and something that reminded me of a Christmas tree or a walk in a pine forest, probably the spruce that is in the name. The taste is weird to me, more of that pine tree (at least thats what I think a pine tree may taste like if I dined on one), some molasses, & some hints of coffee every now and then. Mouthfeel was thin & watery with very little carbonation. This beer just does not work for me. I really don’t like pouring one down the drain but I was tempted to do it with this one. I managed to finish it but it is nothing I would ever get again. I would rather drink water.